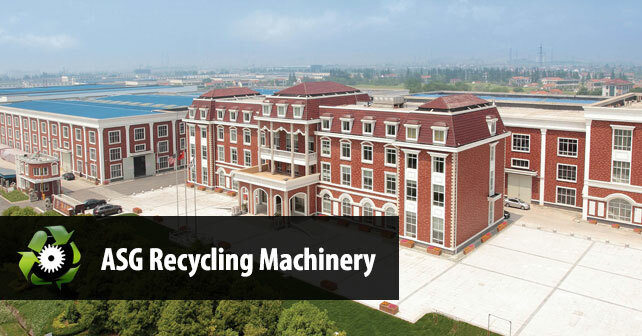 ASG Environmental Science Research & Development Institute of China, ASG Recycling for short, is a professional manufacturer of plastic recycling machinery with an in-house research and development center where all of our recycling machines are designed, tested, and constantly evolving. With more than 300 employees and two decades of experience in the plastic recycling industry, our quality-assured equipment has been exported to more than 50 countries and is being used in countless reprocessing / recycling / washing plants throughout the world. ASG Recycling’s manufacturing facility is located within Jinfeng Industrial Zone, Zhangjiagang City, China and occupies more than 50,000 square meters (our plant is pictured above). All high quality, high precision machinery are CE & ISO9001:2000 certified. We endlessly strive to produce innovative recycling machines that are not only efficient, but durable as well. To accomplish this, we stress the usage of only high grade materials, spare parts, and electric motors from well known Chinese, Japanese & German manufacturers. Although this will tremendously increase our production costs including making our price quotations less competitive, our un-matched quality, customer service, and dedication to after sales has brought us international recognition and a customer base of companies looking for cutting-edge plastic recycling machines that continue to operate year after year. We take pride in each piece of recycling equipment we manufacture. Wether you require machinery for recycling manufacturing scrap, post-consumer plastics, or industrial plastics, we’re extremely confident that the performance of our recycling equipment will satisfy your needs. By the way, if you require a piece of machinery not listed in our catalogue, contact us about alternatives or setting up a custom project. Let our experienced staff help support your needs. P.S: Together we can make a difference, let our plastic recycling machines do all the work for you!